Excellent color reproduction coupled with expert commentary. This is book is 'how it was'. A Railroad Life: On the Road with Mike Bednar features the first 24 episodes of Mike Bednar's famous railroad stories from TRP Magazine (The Railroad Press), richly illustrated with vintage photography. This beautiful 128-page hardcover book includes upgraded photos and even more color! 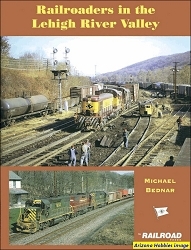 Mike describes railroad operations with incredible detail and you'll enjoy his unique personality and wit! 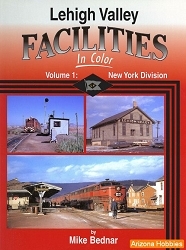 Learn first-hand what it was like to be a railroader in the 1960s, 70s and 80s! Lehigh Valley's Hazelton Man, pp. 124-128. White River Productions, hardcover, 128 pages, 8.5 x 11 x .5 in., Color photographs and extensive captions.